There’s no need for your passion for fashion to conflict with the need for protective swimwear for your children. These amazing creations are where fashion meets function. Babyology reader Amanda has been avidly following our recent posts on gorgeous swimwear, and directed our attention to the equally stunning Babes In The Shade. The collection includes rashies, sun shirts, trunks, hats and all-in-ones. They look the business, are UPF 50+ and chlorine resistant. It’s not always sunshine and lollipops when trying to get your child to wear something that’s sun-safe. But the sun shirts are so darn pretty, who wouldn’t want to strut onto the sand wearing them? They have zip fasteners, making it easy to get them off once wet. The Spotti Dotti Raspberry pattern pictured at the top of the post is Babes In The Shade’s signature, with its playful pattern. The UV suit channels 1960s chic, thanks to the cheeky bell-bottom legs. 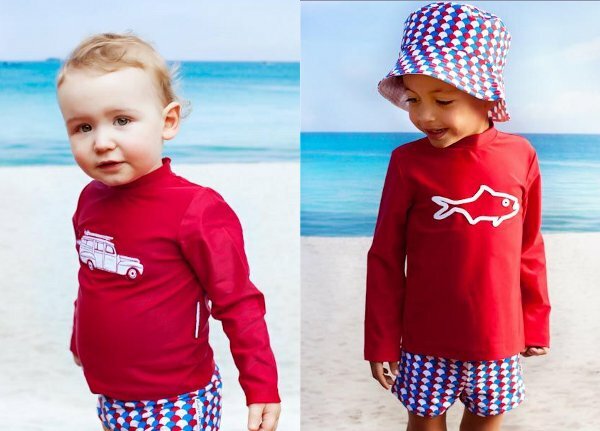 Boys are well catered for, with rugby-inspired UV suits and Camper sun shirts that ooze retro beach charm. Babes In The Shade’s range comes in a huge variety of sizes, from six months to twelve years. The sun shirts are $44, UV suits are $49, and one-piece suits are $29, and are available directly from Babes In The Shade.